The most powerful response you can have to chaos is to remain calm and unattached. If you react, then it becomes your own chaos. Listen to your breath instead and allow its rhythm to be in sync with calmness. 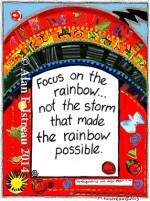 It is then that you will become the calm within the storm and you will become the rainbow. You will become the beauty that is born from the storm created by chaos. What Is Correct For You? This couldn’t have been more timely! What was a beautiful rainy morning at work was quickly turning to chaos with the arrival of MOODS! And, BINGO…into my in-box popped your whisper and I was returned to my happy rainy day self! Timing is everything, right? Thank you as always!! It is always so amazing when I get comments like yours. I’m thrilled that the timing was right for you. Hi Jackie . . . great to hear from you. I moved my Whispers In My Ear messages to this blog a few weeks ago. I was not able to transfer over all the email addresses such as yours. I would love to have you continue to received the messages every Monday, Wednesday and Friday. Could you please go to http://www.WhispersInMyEar.com, and in the upper right there is a box where you can “Follow This Blog”. Put your email address in and we will be talking to each other again. I miss your interesting comments!